Reform measures of the high growth economies (measured in terms of real GDP growth rate), such as China and India, are anticipated to play a key role in attracting higher foreign direct investment (FDI) inflows to Developing Asian region during 2019 and 2020, according to GlobalData, a leading data and analytics company. FDI is segregated into Greenfield and Brownfield investments. Greenfield investment refers to projects built by a parent company in a foreign land from scratch, whereas Brownfield refers to an investment by a company to buy an existing facility for new production. 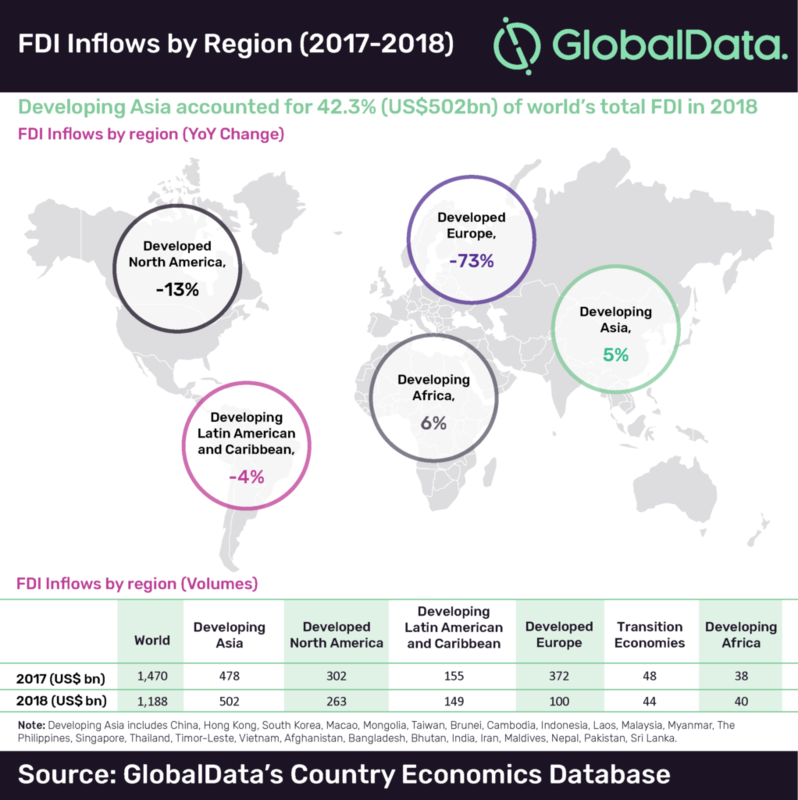 According to UNCTAD’s Investment Trends Monitor Report, the FDI share of Developing Asia to the world’s total increased from 32.5% in 2017 to 42.3% in 2018, amid a decline in the global FDI. Developing Asia was the largest FDI recipient region in 2018 with 84% rise in the announced Greenfield investment projects. According to the preliminary estimates of UNCTAD, FDI inflows in India year-on-year rose by 7% in 2018. In January 2018, the Indian government relaxed the FDI policy for key sectors such as construction & real estate, civil aviation and single brand retail. Complementing these developments, India jumped 53 spots in the ‘World Bank’s Ease of Doing Business (DB)’ ranking over the last two years thereby drawing the attention of foreign investors. The country’s rank improved from 130 in DB2017 report to 100 in DB2018 report and further to 77 in DB2019 report out of 190 countries. Significant improvement has been witnessed in the parameters of construction permits, trading across borders, starting a business, getting credit, getting electricity and enforcing contracts. China has emerged as one of the top destinations of FDI over the last decade. The Chinese government had simplified procedures and eased restrictions for foreign investment in 2017 and subsequently the country’s FDI inflows increased by 2.5% to US$137bn in 2017, following a decline in 2016. The growth rate further accelerated to 3% in 2018. Under the ‘Made in China 2025’ initiative, China is encouraging foreign investment in the fields of infrastructure construction and green manufacturing. The country also envisages fiscal and taxation support policy to make the country more investor friendly and intends to give more authority to the national-level development zones (special areas where foreign investment is encouraged) in investment management. The Regional Comprehensive Economic Partnership (RCEP), which envisages for a free trade agreement between 10 ASEAN economies (Indonesia, Cambodia, Myanmar (Burma), Thailand, Vietnam, Brunei, Laos, Malaysia, Singapore, the Philippines) and six Asia-Pacific nations – India, China, Japan, South Korea, Australia and New Zealand), in its second Summit held in November 2018 made substantial progress and reached the final stage of negotiation. The members are hopeful to conclude the mutually beneficial RCEP in 2019. The likelihood of the agreement is anticipated to provide a stimulus for the investment across ASEAN countries.